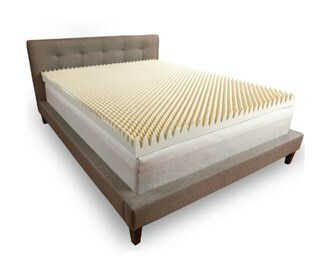 The Comfort Revolution 3 Inch Convoluted Memory Foam Topper is constructed of 3 lb. Features premium high density open cell memory foam technology. The topper conforms to body for greater comfort and support, providing a more restful and rejuvenating sleeping experience. This does not need cover. Topper is placed directly under fitted sheet. - Twin: 39" x 75"
- Twin XL – 39" x 80"
- Full: 54" x 75"
- Queen: 60" x 80"
- King: 76" x 80"
- Cal King: 72" x 84"
The 3 Inch Twin Size Convoluted Memory Foam Topper F02-00063-TW0 has many exciting features for users of all types. See the 3 Inch Twin Size Convoluted Memory Foam Topper F02-00063-TW0 gallery images above for more product views. The 3 Inch Twin Size Convoluted Memory Foam Topper F02-00063-TW0 is sold as a Brand New Unopened Item.